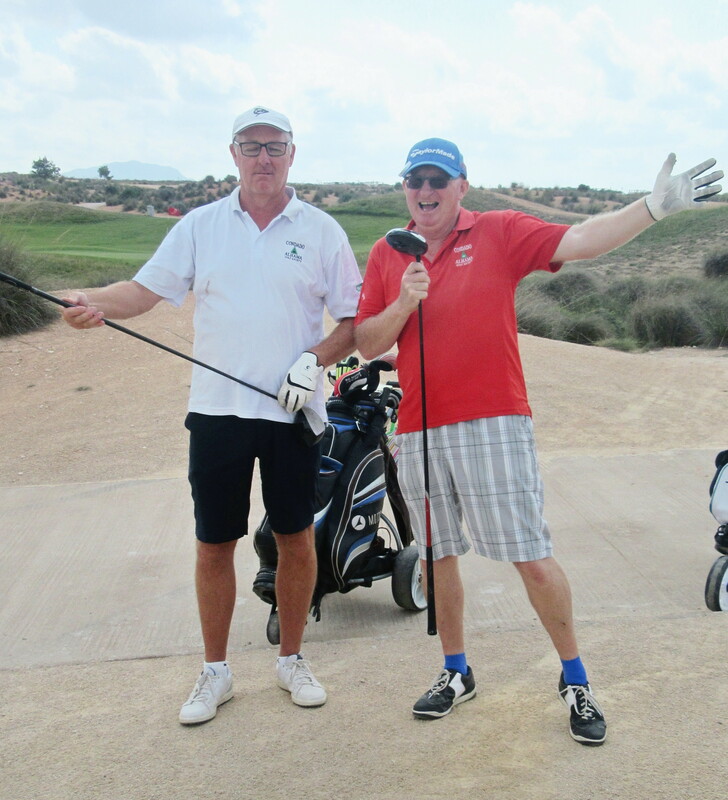 When I saw my partners were Don and Phil, I thought it was celebrity golf with the Everly brothers, but I heard them sing and if it was them, the years have not been kind………..
56 players this week with John Collins coming out top, but also some other excellent scores. 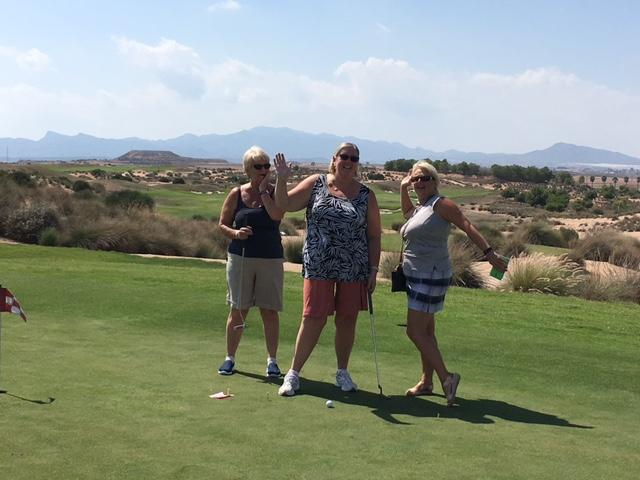 Great golfing weather, with temperatures down to a very pleasant 26 degrees and very little wind. Many thanks to John’s wife, Janise, who acted as starter. 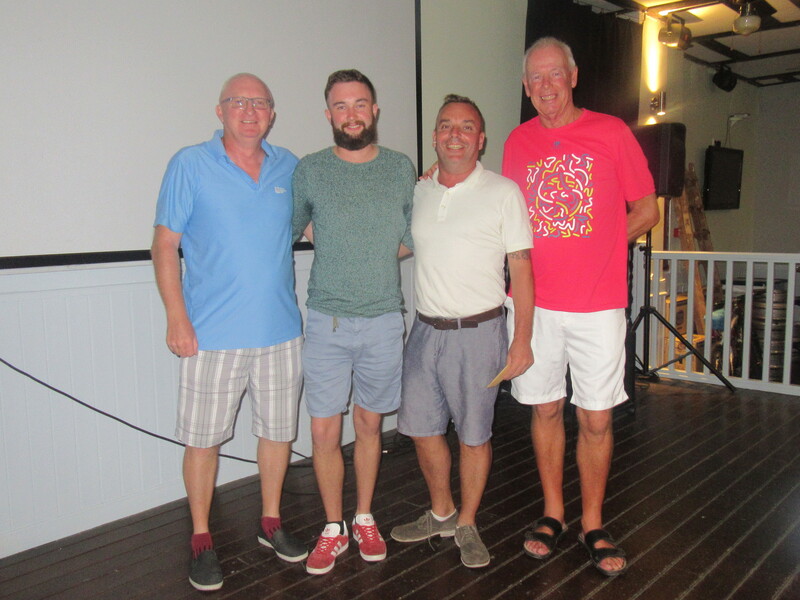 and another scot, Tom McFarlane won division one…………………. 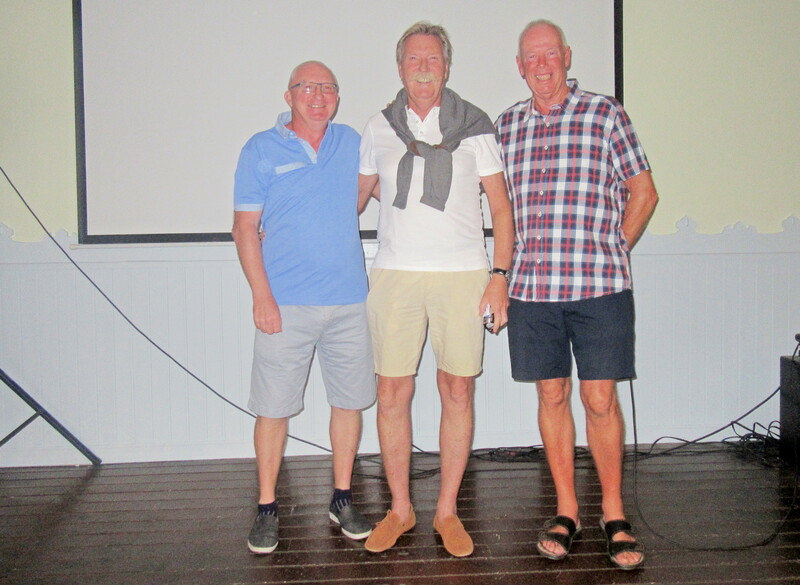 Sven Erik won division 2 for Norway……………….. This week neither of the front runners for the annual Apollo Air championship, Kevin Smith and Chris King played, but no great inroads by others to challenge them. John Collins has 3 more monthly competitions to get his 6th qualifier in, and with one good result (as this week) could come very close. 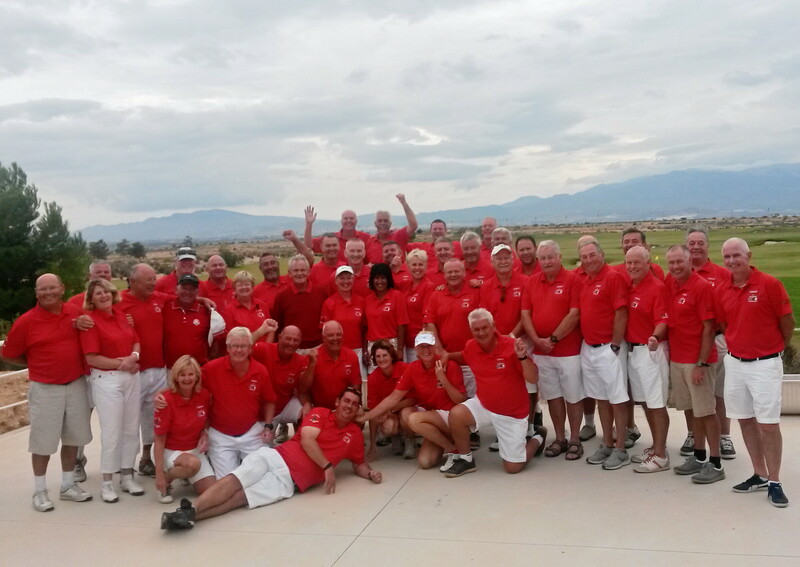 Next week we have the away day to Hacienda del Alamo on Monday, followed by a pairs stableford event on Friday. This man was on the run for 30 years, and then they thought they had got him – but had they? 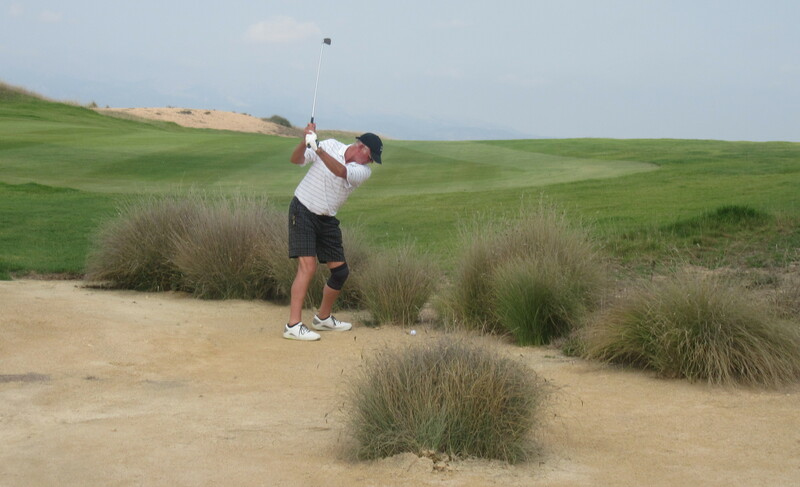 He has been lying low in Puerto de Mazarron, only surfacing to play in the Condado de Alhama golf society, where he regularly robs members of their money, winning every week. 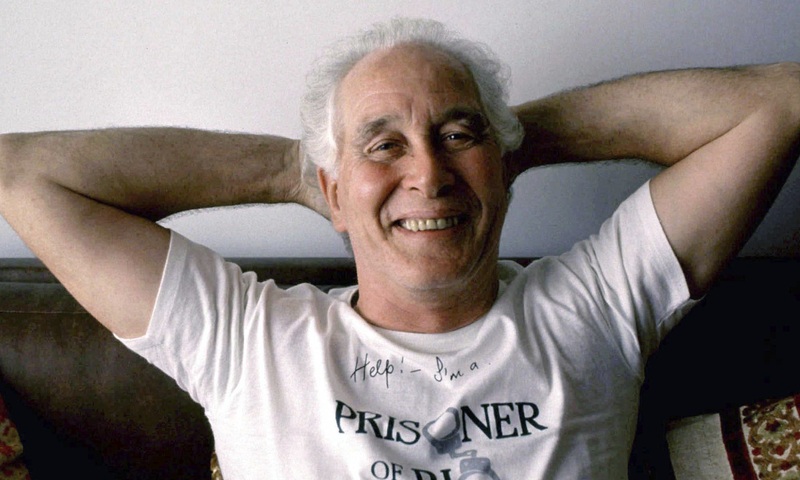 Ronnie Biggs has been assuming the identity of Jeff Ruellan, who as everyone knows has never been any good at golf. 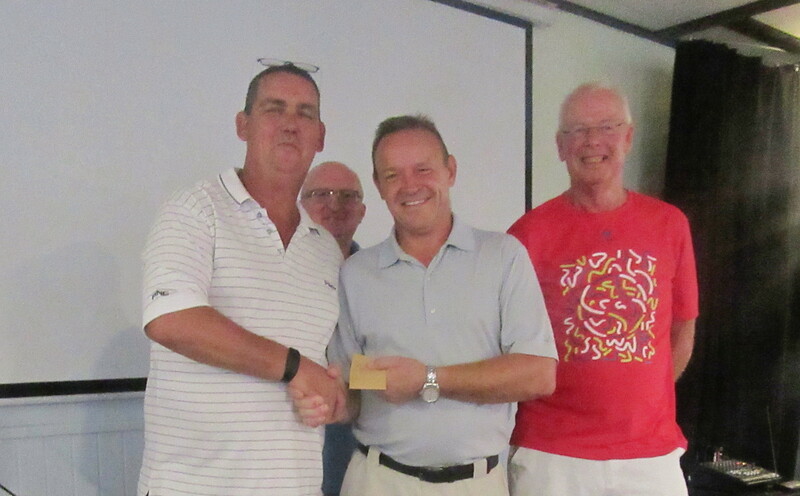 Well, I think that must be the reason that Jeff wins every week…………………..
Just to let members know what is coming up – a very cheap away day, and October is our busiest period of the year. Only 35 euros for a great day out and then September is gone! 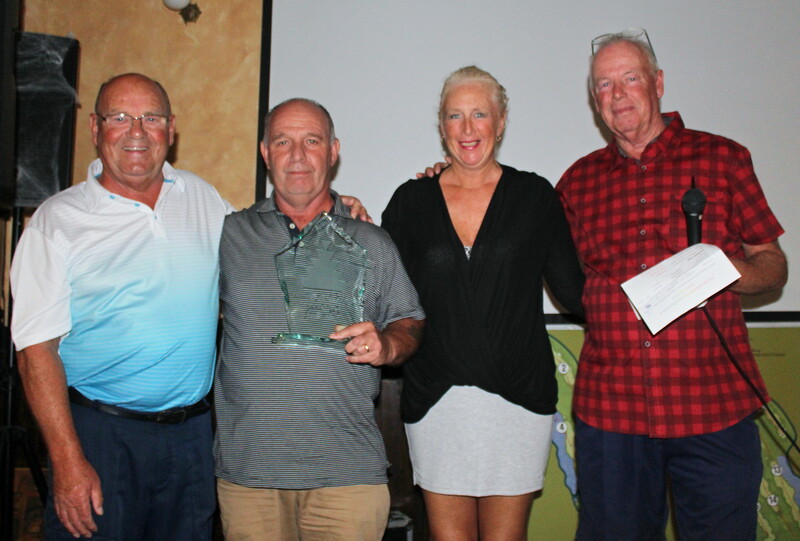 October brings the Aguilon qualifiers for their Ryder Cup, the popular Barry Answer Trophy, Seniors championship, Apollo Air and the biggest – the 8th annual Viking Cup! 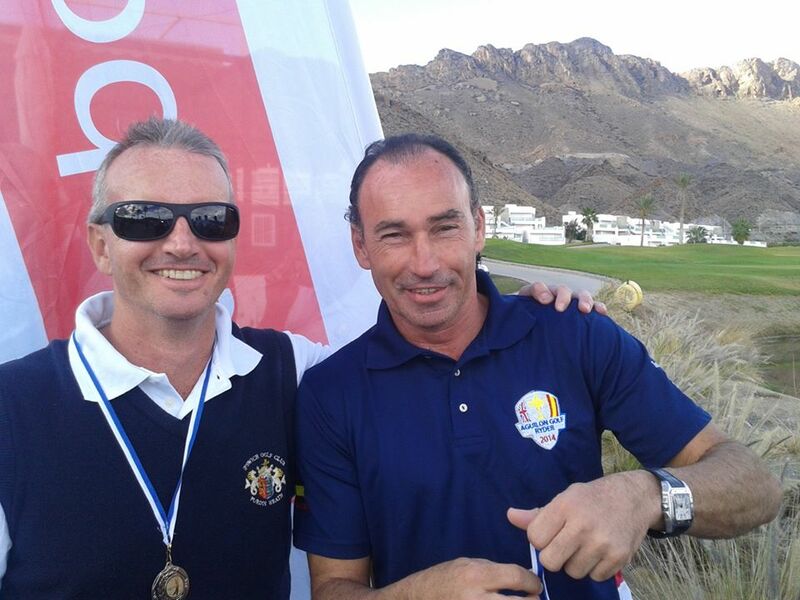 Chris King with the famous Murcian bullfighter, Pepin Liria, at the Ryder Cup………………..
UK & Ireland above, Scandinavia below…………………………..
Sandy Simpson with the winner of the Seniors in 2016, Dave Cooke………………..
it wasn’t just about the serious golfers today – a big turn out for the non-golfers putting competition…..
Friday was the 5th Cath Emmett-Smith ladies day, and was kindly sponsored by Jan and Jeff from the Condado Club. 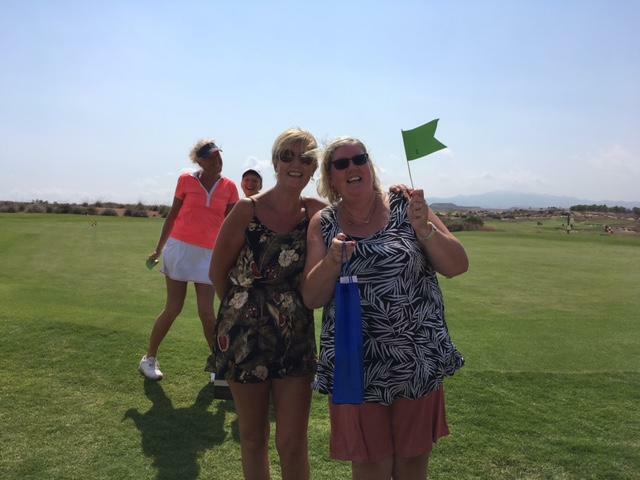 Again the non-golfers were encouraged to join in, and there were more entries for that than for the major event! 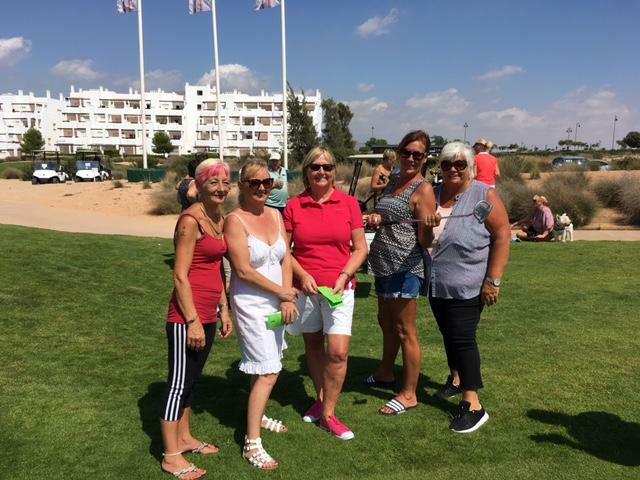 10 ladies went for the main prize, but about 30 turned up for the putting (or was it for the free cava!). 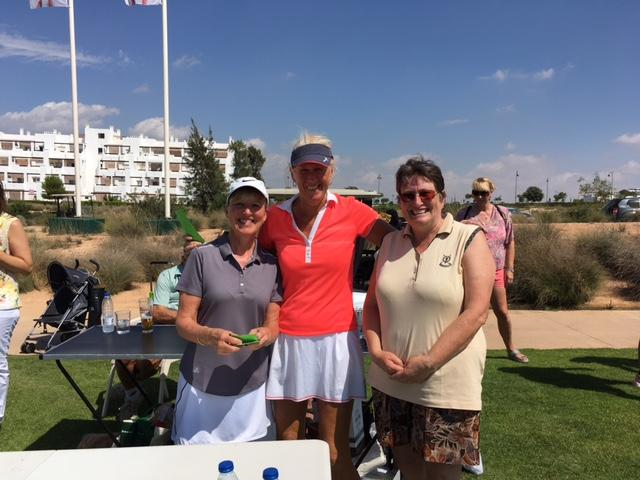 Apart from Jan and Jeff, Sissel Hagen,Yiva Johnson bought all the bottles for the ladies and there was also bags of gifts from Christine Lawson and Jane Mitchell. This meant every lady golfer who attended the dinner got a gift. 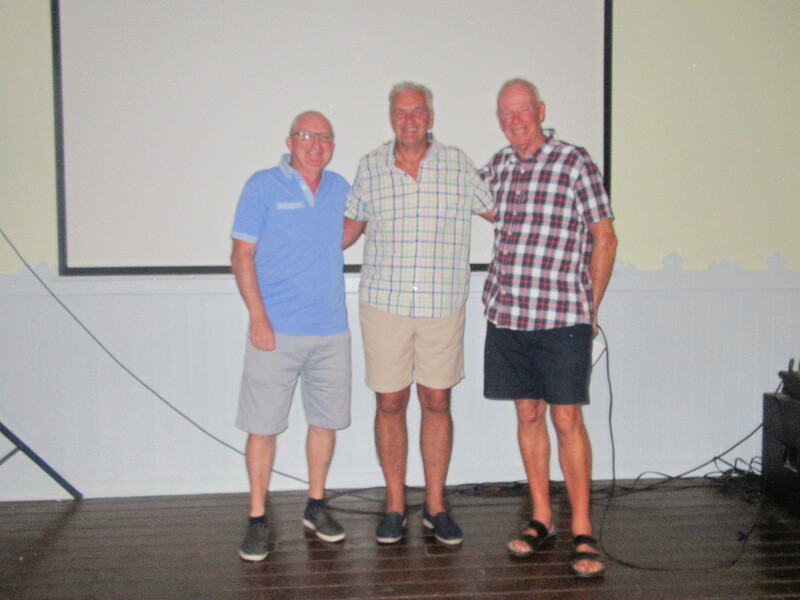 ….that might encourage those who played and didn’t come to the evening presentation to do so in the future. 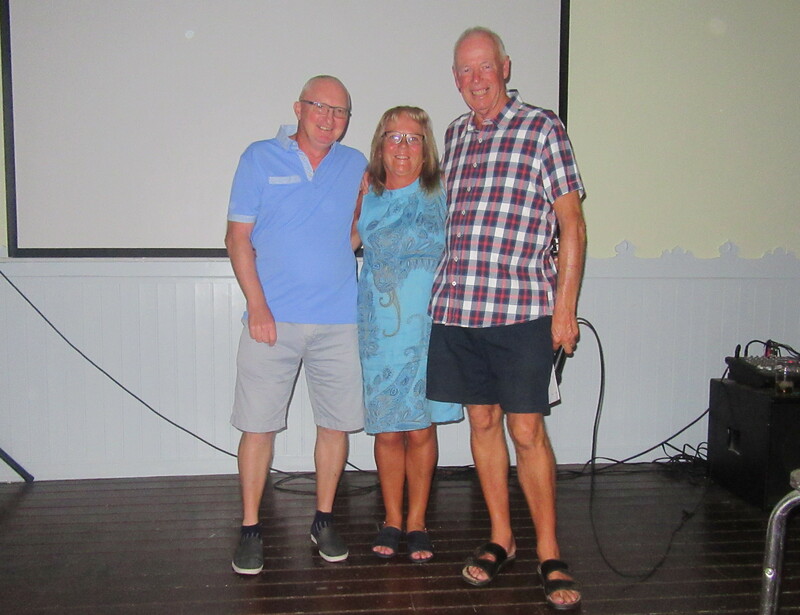 Thanks to Liz Beaton who acted as starter for the serious golfers, and to Alicia and Kim for organising the golf and evening presentation. 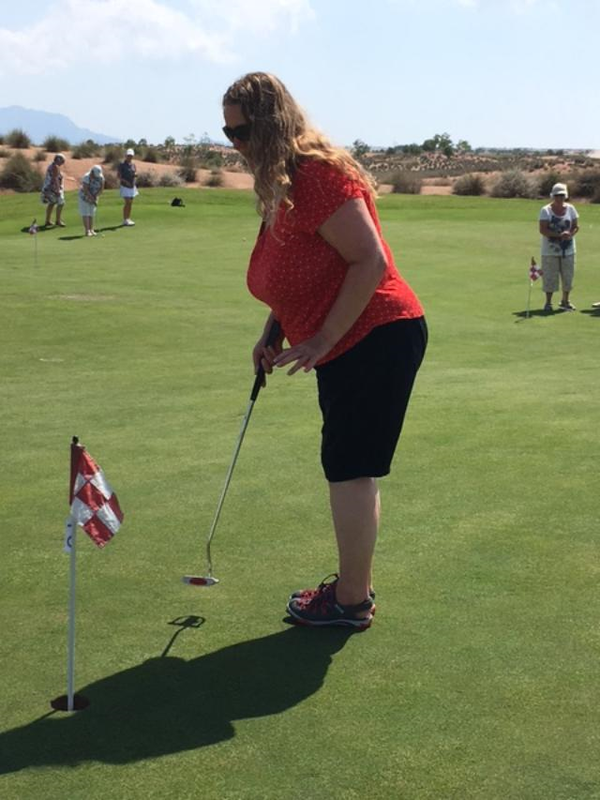 The cava drinkers were given some tuition from the real golfers on the putting green. 50 golfers in the men’s undercard event with 2 divisions. 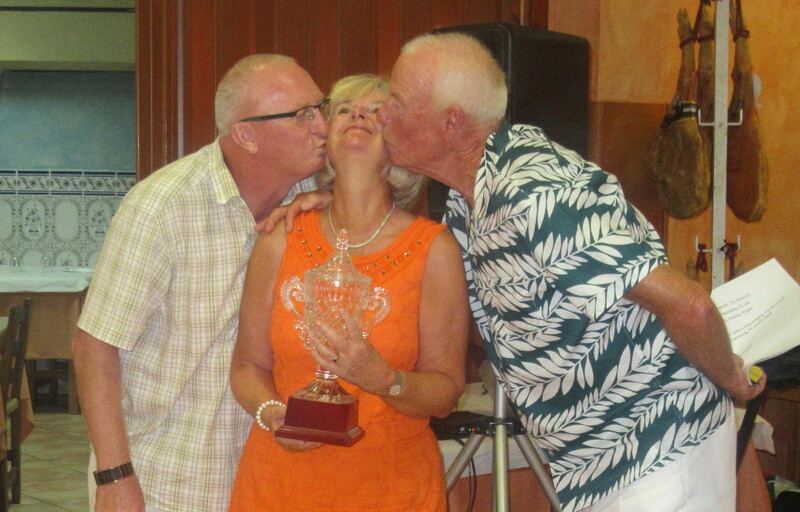 Lynda was so happy – no idea she had won………. 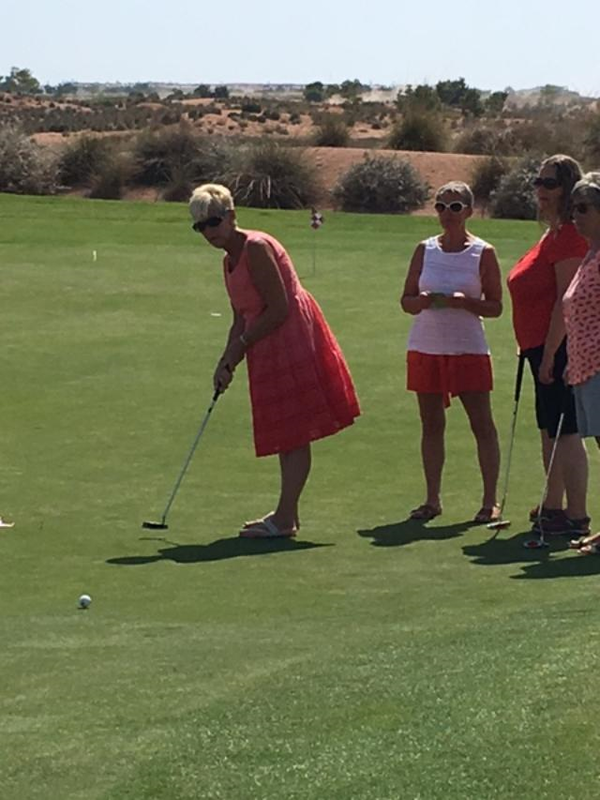 And not to forget the non-golfers putting competition which was won by Denise Howson (with my left-handed putter!). 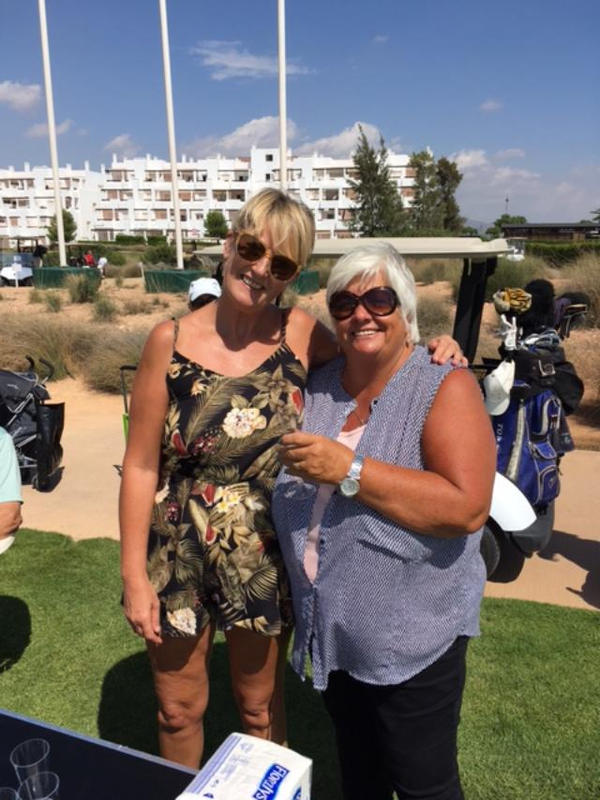 Denise (centre) won the putting competition……..
the winner, Denise, with her prize…………………. 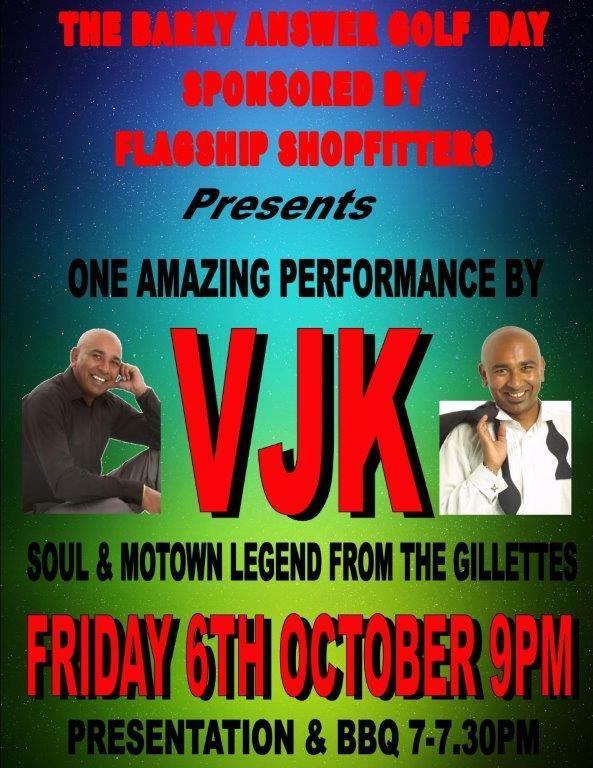 some of the hopeful contestants……………. they really took it seriously………………. 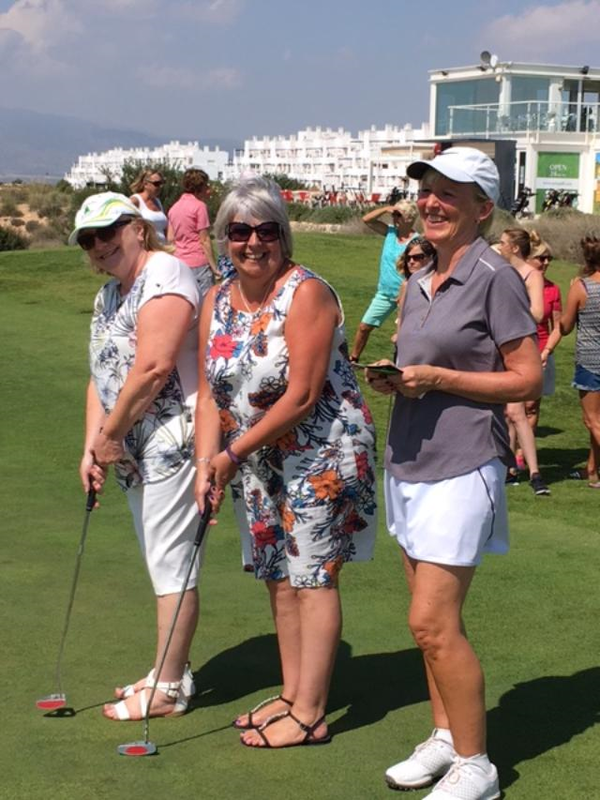 I think it went in…………..
sponsor Jan and photographer Lynn………..
some of the professional experts who helped the novices – Kim, Alicia and Christine………………. Thanks to Lynn Simpson, who took these photos as I was out on the course……………………………………. 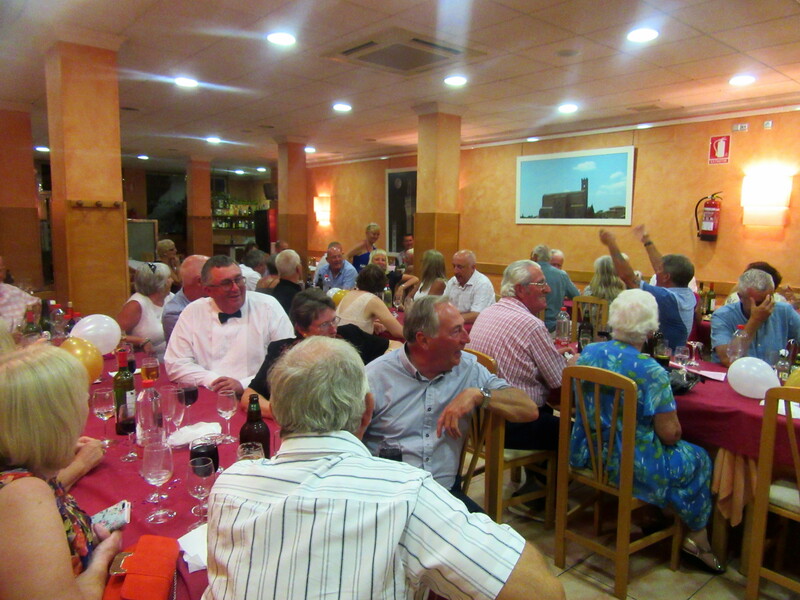 The presentation was at La Siena restaurant in Mazarron (old town), the food was superb and it was well attended to see Steve Fisher appear as Rod Stewart. 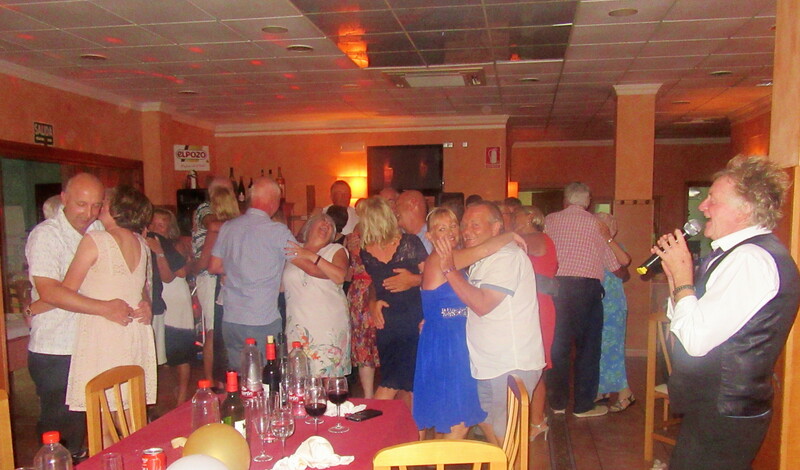 Rod Stewart kept them dancing………………..
Next week is the Apollo Air individual stableford – the race to be the annual champion is hotting up………………………. 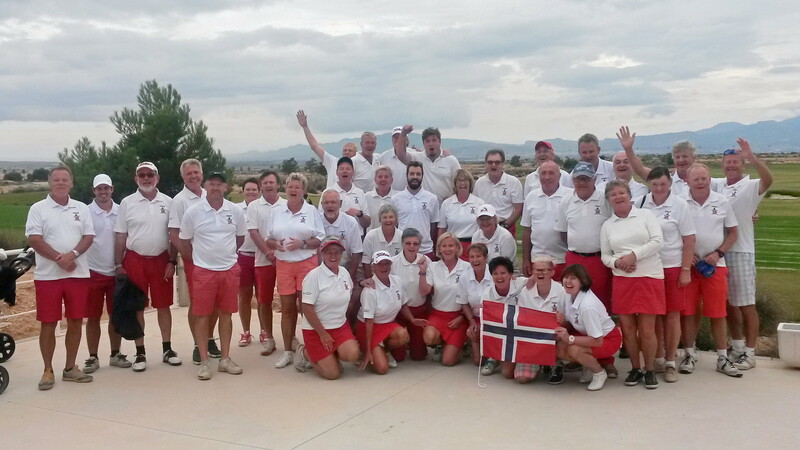 This week was a pairs competition – 46 players and lots of scores over 40 points, with 46 being good enough to win. well done, Pete and Dan………………………. 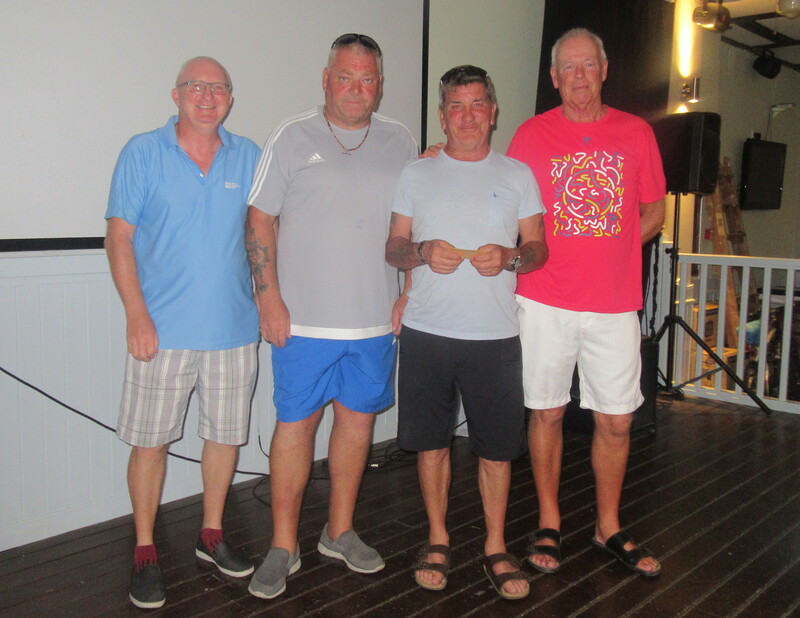 Geordies Milt and Stevie were second……………………. 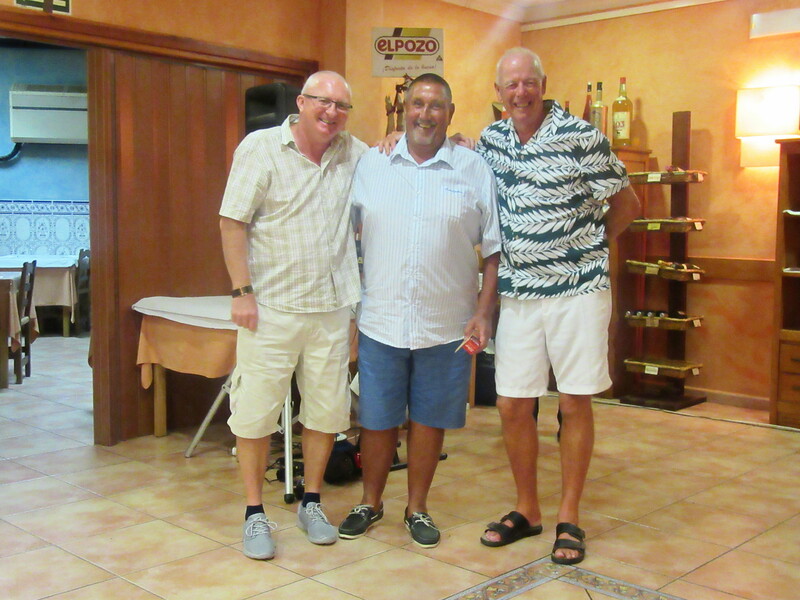 Just a couple of photos of players not usually pictured here…………………..
And the evening presentation follows, see last week’s blog for details. See Neil or Alicia if you want to play in the away day at Hacienda del Alamo. 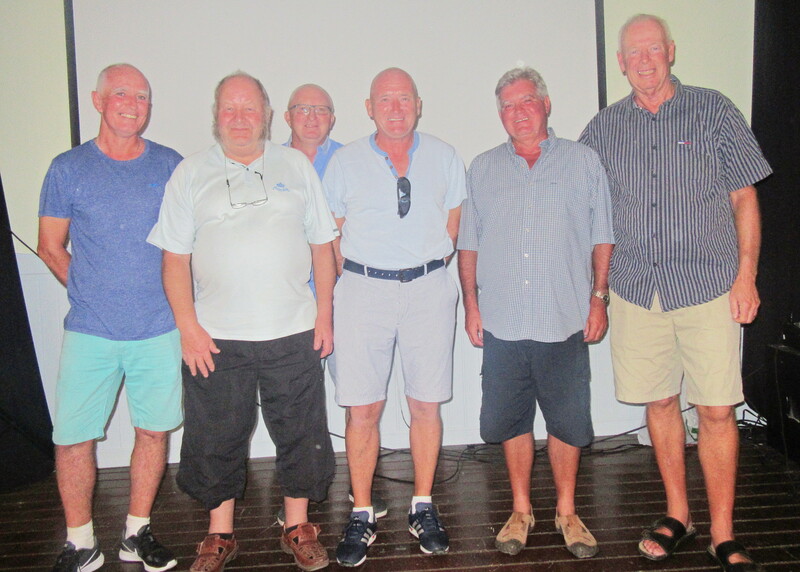 Sad news about a Saurines society member – information below………….. 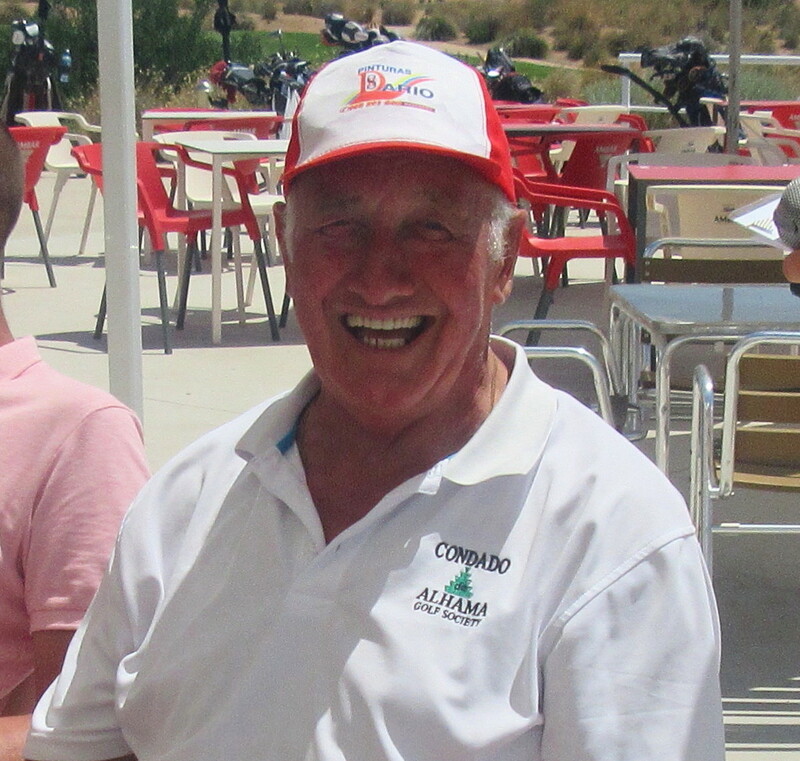 Apologies to be the bearer of some very sad news, but I have to inform you that Club 25 Society member and good friend Andrew Duffy suffered , although yet unconfirmed, what seems to have been a massive heart attack whilst playing with our Society at Mar Menor yesterday morning, Sunday 3rd September. Despite every attempt to revive him by members and ambulance crews we were unable to save him. Club 25 are deeply saddened by this sudden and unexpected passing of Andy, he passed away playing the game he truly loved. All our thoughts and prayers are with his wife Mary, his children Rachel, Dominic and Aidan, and his family as this very sad time. 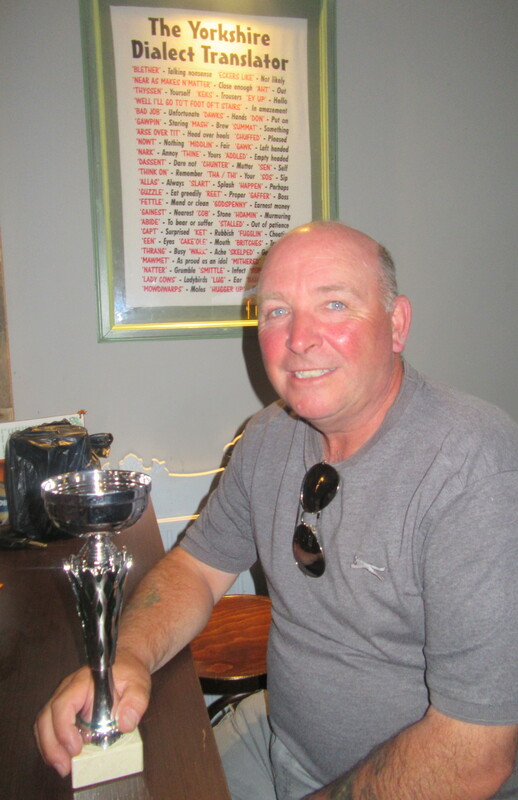 Andy was a cheerful, easy going family oriented person, a keen Tottenham fan, who got on very well with all the people in our society, he will be sadly missed by all who knew him. Andy’s service is likely to be at a local Crematorium this Wednesday or Thursday, however, I will let you know the confirmed details as soon as I have them. 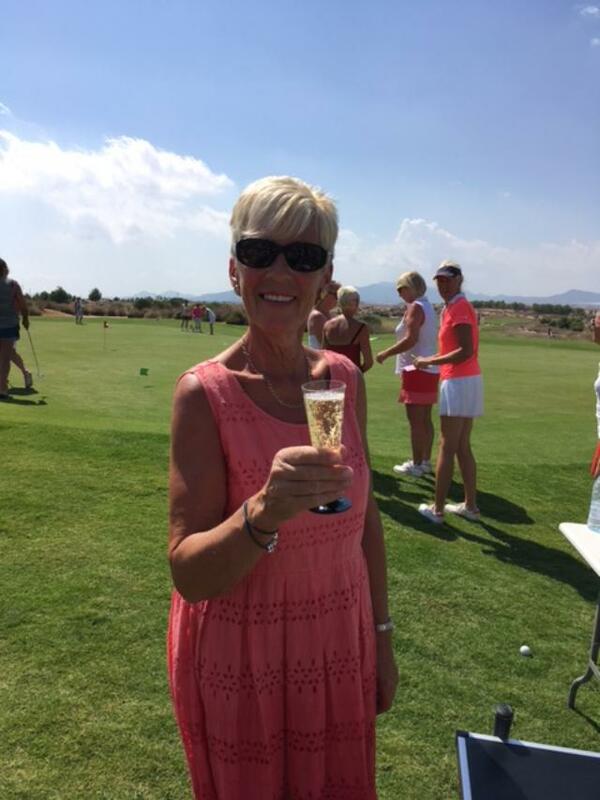 A late message from Les regarding this year’s Ryder Cup competition at Aguilon golf………………………..
Saturday and Singles Matchplay on Sunday. For those wishing to play for the U.K. team there will be 3 qualifying competitions. handicap and then apply the relevant slope handicap of the tee chosen. and the 2nd or 3rd round will be 15 euros. Raufer) at this email address, NOT the club. 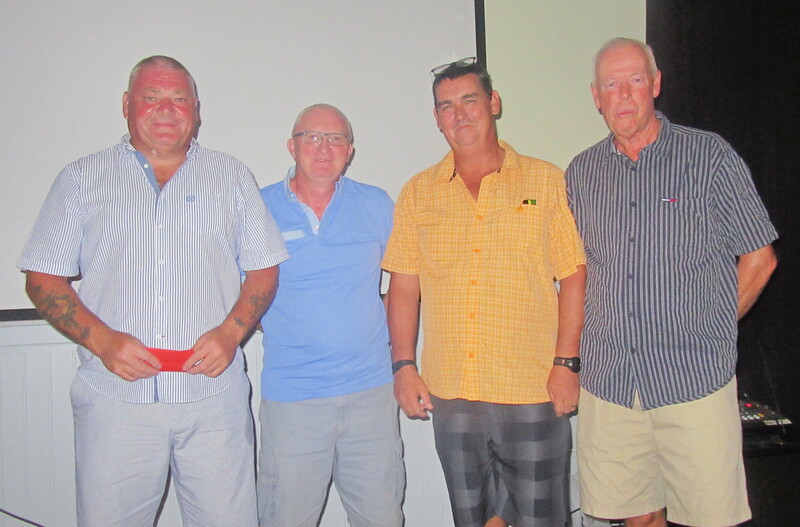 4th & 5th November is 40 euros for non members and 30 euros for members, this includes the two days golf inc buggy, a team polo shirt and a bar-b-que after the presentation. Good luck to all participants and it is about time we regained the cup. This week was a team competition with 2 to count on the first 6 holes, 3 on the next 6 and all to count for the last six. 43 players were involved. I don’t usually mention 2’s, but Mike Dean’s 3 twos in one round was remarkable! Thanks to Alicia for acting as starter – she couldn’t play due to a problem with a stilletto……………. 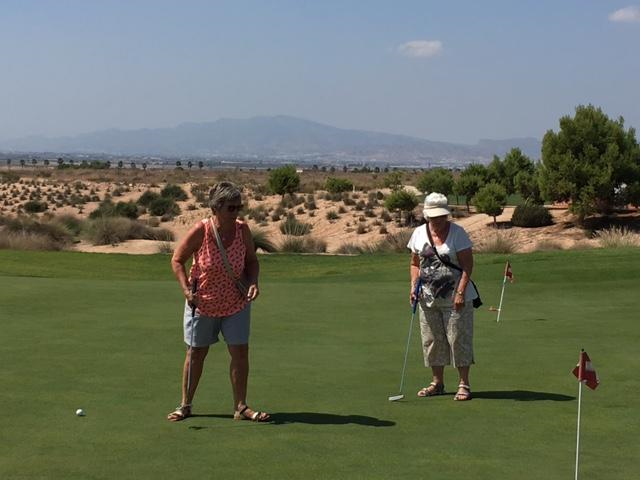 Don Henry should use a putter off the tee – play it under the wind…………………..
A reminder that the green fee reduction for 3 months of summer has now finished – now 42€ walking, 47€ with buggy (plus insurance if needed).